Whether you live around the block, or around the world, let’s create a custom painting that will inspire and uplift you and your interior space. Let me know what you are looking for and maybe we can work together to create a piece that speaks to your vision. Whether it’s recreating an earlier work, or painting something entirely new, the focus is the same; to create a ‘moving’ art piece especially painted for you or someone you love. Every intuitive painting is created from love and it’s this energy that is passed on to the viewer. Want to find out more about the commission process and to see a work in progress? As of March 20, 2019 – there is about a 2 month wait for custom paintings. How is a commissioned painting approached? 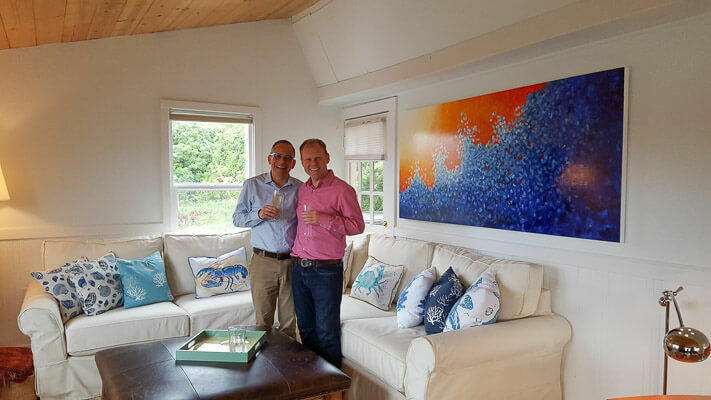 My partner, Philippe, and I have been searching for a large piece of art for our home in Bodega Bay. I happened upon Deb Breton’s website searching through artists at a local art fair. I emailed Deb about one of her pieces and she responded promptly that she would be happy to meet with us at her studio near our home to discuss commissioning artwork for our home. After meeting with Deb (and her wife Deb), we were really impressed with her passion and talent. Deb came to our home in Bodega Bay to see the space and then worked very collaboratively with both of us on the details of this abstract piece. Deb communicates clearly and is really open her customer’s preferences and aesthetics. “Infinte Motion”, the final piece that Deb created for our home blew us away. It captured the colors, light, and feeling we wanted for the space. It really felt like we co-created the piece with Deb. 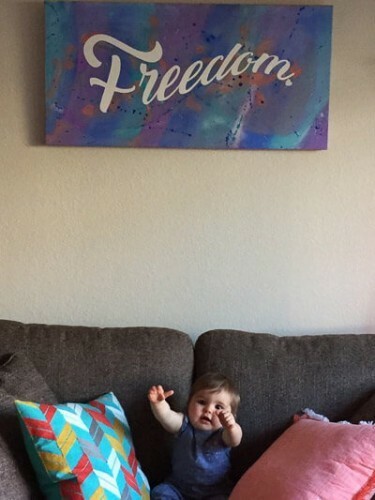 The piece has transformed the room and is a source of joy for both of us. We highly recommend Deb to anyone looking for a collaborative and talented artist to create the perfect piece for your home. Once we’ve nailed down the size, colors and design, it usually takes about 4 weeks to complete your custom piece. Sometimes, it might take longer, depending on complexity and size. Then, with a 50% deposit, your work will begin. You’ll get pictures of your painting in progress, so we are always “on the same page” together. Your custom painting is completed when you are in love with the piece. Commissions start at $640 for a 20″ x 20″ or any size combination that begins at 40 linear inches. Serious inquiries only please. then let’s talk about possibly working together. Drop me a message and let’s talk about co-creating some amazing art together!